Eden’s Rivers Soaps contain coconut oil which creates nice, white, fluffy bubbles which exist solely for your enjoyment. 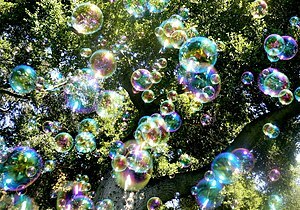 Who doesn’t like bubbles? Soap should be fun. Grown in the warm climates of Asia and the South Pacific, coconut oil has been used for centuries for skin care. According to Organic Facts, coconut oil has antimicrobial and antibacterial qualities do to its high levels of ” lauric acid, capric acid and caprylic acid. In soaps this oil produces a harder, longer lasting bar of soap which means you can use one bar longer and that saves you money! firstly, heat the oil(don’t know the exact reason why, but i have awyals done it and my mum and my gran and evryone else i know(like heating essential oils). anyway, you can heat it by placing a little in the microwave or place bottle in boiling water. pour some in a saucer/bowl. then dip your fingers in and massage in to you head, try starying at your roots and then work your way out. eventually you will cover your entire head. keep dipping in bowl after every section of hair, you will know when to apply more. for best results, sleep with it or if you have to wash it out, leave on for as long as you can(put cling wrap, or shower cap to retain heat and for optimum effect. Yeah, olive oil is great for the hair and also for soap making too! It’s one of the main oils I use. coconut oil is transparent. plbbaory, the one you saw was cooled, that why it looks creamy or white. you can buy this at supermarkets.once i took a teaspoon of coconut oil and it doesn’t taste good. uuhh. Coconut oil can be confusing…some people think it’s bad for you, some think it’s good. Personally, I love it. Yeah, like I said above–coconut oil has a lot of mixed press. when its hardened or coloed it turns white, when its melted into liquid form it turns into this white wine champagne(ish) color.I get mine at whole foods for about 4.99 in a 4oz jar. Thanks for commenting! For soaps, I usually buy mine wholesale in gallons, but when I make something special, like shea butter mousse, I use Whole Food’s Organic Virgin Coconut Oil. It is smoother and better for the skin. 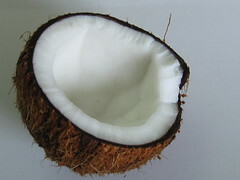 i use pure coconut oil as a deep hair conditioning treatment. love it!! I do too! It’s so much cheaper to use coconut oil than to buy those $10+ deep hair conditioners. Not to mention, it works better than most of them.